When it comes to investing in gold, those who are interested are spoiled for choice as far as variety is concerned. There are so many different sizes of gold bars and even more companies producing them, and the number is constantly growing. Even though gold bars, for the most part, have the same design across different producers, some people are loyal only to one, specific brand. Just like a person may choose a more expensive pair of pants over a similar pair priced for less because of the brand on the tag, some investors will pay more for a particular bar due to the brand name stamped onto it. One of the most popular brands of gold bars is OPM, or Ohio Precious Metals. This North-American based mint is unique for a number of reasons, and has grown to become one of the most popular mints in North America for many of the same reasons. OPM was founded in Jackson, Ohio back in 1974 and has been minting gold and silver products ever since. Since day 1, OPM has operated as an environmentally responsible company in that all of its gold and silver products are sourced from recycled materials. Unlike other big companies whose operations are incredibly harmful to the environment, OPM has made it a point to operate in the most environmentally responsible manner possible. While OPM is constantly expanding its reach into the precious metals industry and beyond, it has not lost touch with its simple roots seeing as it is based in the same small town it was when the company was founded almost 40 years ago. OPM, like many popular mints, offers a number of different types and sizes of gold bars as to suit every type of investor. Perhaps the most sought after OPM gold bar is their 1 ounce variety. This bar is small as far as actual size and weight is concerned, but even one 1 ounce bar of gold is enough to constitute a small investment. OPM is unlike other mints, however, in that not every one of their 1 oz gold bars have a similar design. Some styles of their gold bars, such as the Lunar series, have different designs in addition to the simple stamping of the weight, purity, and mintmark. 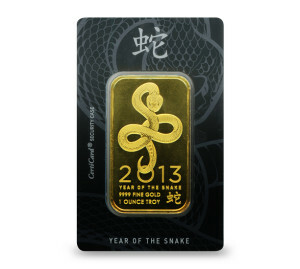 For example, the 1 oz OPM Lunar Snake bar is made with the image of a snake stamped onto the one side of the bar in order to commemorate the Chinese calendar’s year of the snake. Apart from the Lunar series, most OPM gold bars have a fairly standard design with the same basic weight, purity, and mintmark stamps you will find on most other 1 oz bars. The other highly sought after OPM bar is their 1 kilogram bar. This bar is much larger than the 1 ounce gold bar seeing as it weighs over 32 ounces. Instead of an assay card, something that is commonly found with 1 ounce OPM gold bars, the 1 kilo bars have a unique serial number stamped into the bar to guarantee its authenticity. In case you are unaware, an assay card is simple a piece of plastic or paper which accompanies a small bar in order to prove the bar’s authenticity. More often than not the assay card also acts as a protective case for your small, easily damaged 1 ounce gold bars. When you are discussing the purchase of precious metals, the word premium is used to describe the amount of money, above the spot value of the bar’s gold content, that is added to the price of the bar itself. This extra cost is intended to help the seller of the metal both have the ability to cover the costs of running a business as well as a means of deriving a profit from the sale of gold. If it weren’t for premiums on your precious metals purchases, many of the dealers you trust and love today may not be able to stay in business. As far as OPM gold bars are concerned, typical premiums can range anywhere from $10-$30 above spot, sometimes even higher. Premiums are not set in stone and are always changing, which means as an investor your goal is to shop around and find the lowest premium possible for a given bar. By having a lower premium, you are giving your investment more opportunity to grow.